As you know, we have already lost a few great artists this year. One of those was Alan Rickman and although he may always be best known for his captivating portrayal of Severus Snape in the Harry Potter movies, he won my heart earlier and it wasn’t for his role in Love, Actually and it wasn’t for playing the villian in Die Hard. Rather, it was for his role as the disillusioned actor whose stint as an alien on a Star Trek-like show had marked him for life. 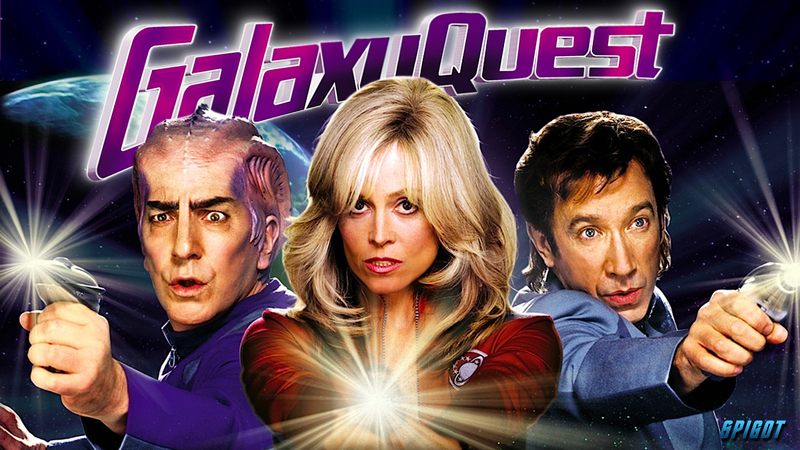 Galaxy Quest is a surprisingly clever and funny movie about a cheesy science fiction program like Star Trek whose passionate fan base elevated it to cult status. Eighteen years since the final episode, the cast stays together for the comic con circuit though they don’t really like each other any more. Then one day Jason Nesmith, who played the captain, (Tim Allen) is approached by a group of aliens in humanoid disguise who plead for the help of his crew. Turns out, they had watched every episode of Galaxy Quest, believing it to be historical documentation, not fiction. Whether it’s for ego or the chance to make a real difference, Nesmith convinces the crew to join him to fight the vicious enemy of their new alien friends. With a cast including Sigourney Weaver, Tony Shaloub, and of course Alan Rickman, what I thought would be a really dumb movie is actually quite funny and charming. There’s even a tip of the hat to the die-hard fans whose intimate knowledge of the entire series helps to save lives. Although it has a little violence, it’s a generally family-friendly movie though the Star Trek references will like be lost on younger audiences. A fun science fiction comedy to watch in bed in honor of the great Alan Rickman.